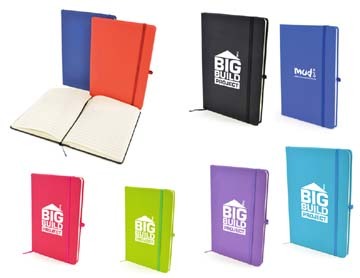 A5 notebook - soft touch cover, with elastic closure, ribbon marker and pen loop. Available in a range of colours with a very good print area - supplied in cartons of 50. Unit price for 50: €4.85 / 100: €3.80 / 250: € 3.35 - prices include a one colour print on the front cover. Prices exclude vat @ 23%, print set-up charges and delivery charges also apply.